Scientists create hybrid human-pig in lab. Scientists had already found a way of taking a mouse and growing pancreatic tissue belonging to a rat. They revealed that the pancreas had been used to successfully treat diabetes as parts of the organs had been transplanted into mice that were diseased. This is a concept that was taken one step further by the researchers of the Salk group and they made use of CRISPR, the genome editing tool, to get into the blastocysts of the mouse. They then deleted the genes belonging to the mice that need to grow certain organs. The scientists then introduced the stem cells from rats that would be capable of producing the organs and found that the cells flourished. The resulting mice lived to become adult mice and some of them grew chimeric gallbladders that were rat and mouse cells, despite the fact that rats do not have that organ. The researchers then took the stem cells from the rats and they were injected into the blastocysts of pigs but it failed as pigs and rats have gestation times that are very different. Pigs, on the other hand, do have a similarity to humans and their organs look a great deal like those of humans. The task was still not easy as scientists had to get the timing perfect when introducing the cells of humans to the pigs so that they did not kill them. Ju Wu said that they had tried three types of cells from humans during the experimental process. Finally, they found that naïve pluripotent cells would not last as long as ones with more development. 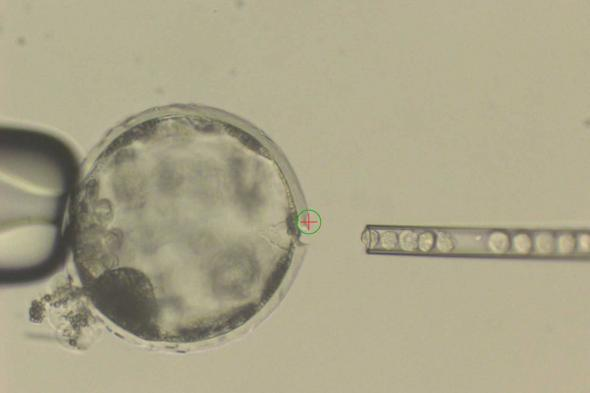 The embryos survived when they injected the human cells that were just right into the pig embryos. These were then put into the adult pigs, which were left to carry them for about four weeks before being removed and then analyzed. 186 late stage chimeric embryos survived with each of them having about 1 in 100,000 cells from humans.